because “Data about exercise routes shared online by soldiers can be used to pinpoint overseas facilities”. 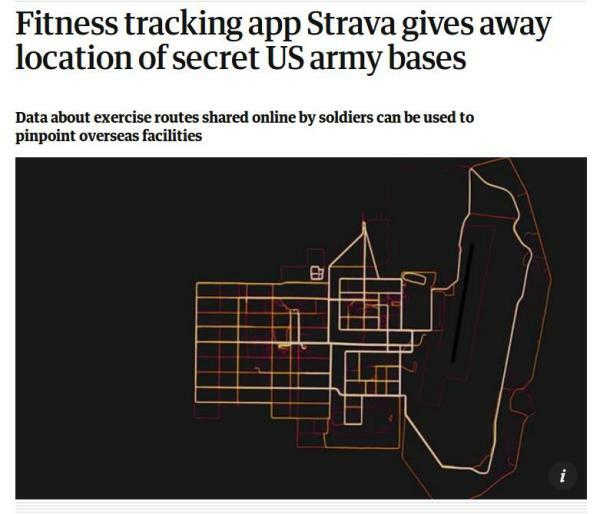 “Fitness tracking app shows how easy it would be, for any foreign power, to corrupt just one person in ANY big social network, in order to have real time location data of military personnel”. That problem is the result of human nature combined with centralized digital platforms. Fixing human nature (assuming it were right, of course) is almost impossible. Fixing centralized platforms is much easier, but only in comparison! The real solution is making centralized platforms unneeded. Some decades ago, DARPA contributed to develop the bases of the Internet, and did it also for military reasons. Maybe it’s time that, for the same reasons, they seriously sponsor really personal clouds instead. Even if such a support would not make their NSA cousins really happy.